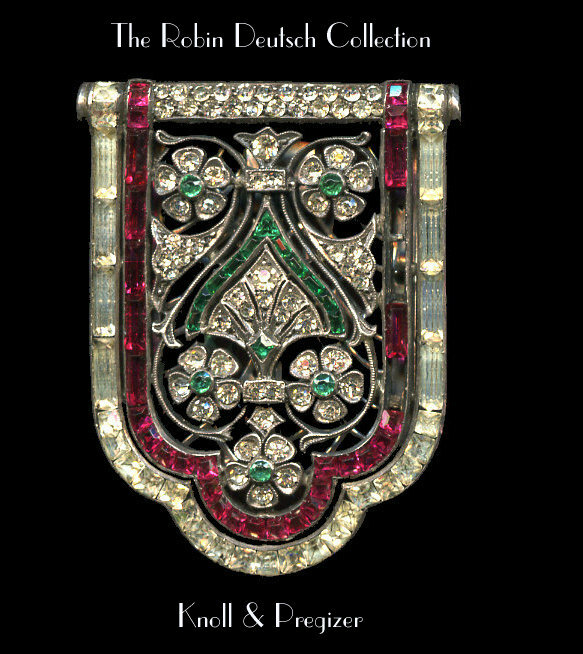 This beautiful use of color and style of this clip has an Indian influence so prevalent in art deco jewelry. A mixture of calibré-cut,baguette,round and even a triangular stone. Bullet nose emerald colored cabochons on either side of the top. Wonderful workmanship and extremely high quality. Similar clip also by KP in European Designer Jewelry by Ginger Moro in her German section page 127. The reference is only to KP on the clip. There was no knowledge of Knoll & Pregizer at that time.